For this weeks recipe, I thought I’d try something new and have partnered with Ashley Adamant from the blog Practical Self Reliance to do a recipe exchange. 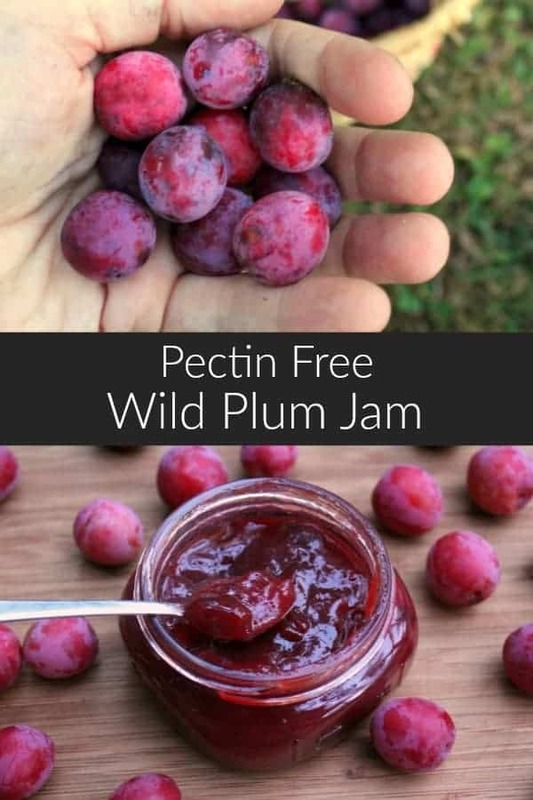 She created this wonderful pectin free, wild foraged plum jam that is easily made at home, even with no canning experience. 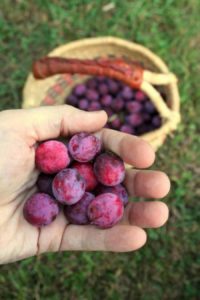 If foraging isn’t your cup of tea Ashley has included instructions for using commercially grown plums as well. You can find Ashley at www.practicalselfreliance.com as well as on Instagram, Facebook and Twitter. Huge crops of wild plums ripen at the edge of woodlands across North America each fall, and most are left to the squirrels. The plums are small, only slightly bigger than a cherry, but most are flavorful and sweet. 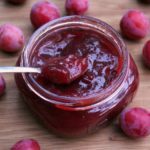 With a bit of added sugar, wild plums cook into a tasty wild foraged jam without any added pectin. In Vermont, the first wild plums ripen in early September and individual trees continue producing all the way through October and the first frosts of winter. Unlike commercial plums, that have been bred for size and intense sweetness, wild plums are small and often tart. Plums don’t come true to seed, and each wild plum tree will produce fruit with a slightly different taste. Some will be pleasant for fresh eating, but many have hints of bitterness and tanning, and they can pucker the mouth. Once you add a bit of sugar, all that pucker turns into complexity of flavor. Historically, wild apples with tart or bitter flavors were prized additions to homemade cider. When you’re pressing apples for cider, it’s important to balance sweetness with acid and tannin to create a more rounded flavor. 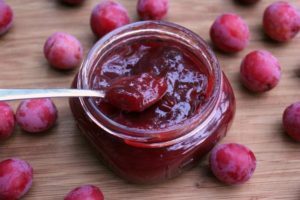 Wild plum jam has that rounded flavor, rather than the one dimensional sweetness of many commercial jams. Wild plum skins tend to contain most of the “character” and have more bitter flavor. If you’d like a milder jam, strain out the peels early in the cooking process. I leave them in because I feel they add a beautiful color to the finished jam, as well as a bit of texture. They also contain a good bit of pectin, which helps the jam thicken more quickly. 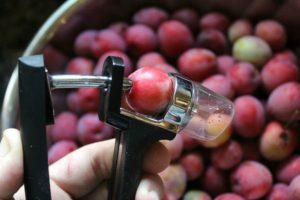 I like to pit the wild plums with a cherry pitter before making jam, and since I don’t have to strain out the seeds, the jam also keeps a chunky texture and the colorful plum skins. After pitting, the plums can go into the pot whole or quickly chopped, depending on your preference. The plums will need a bit of liquid added at the beginning to prevent them from scorching on the bottom of the pot, and I add a bit of lemon juice to the jam at this point for safety. I didn’t use to be this careful in my canning, and I happily put away jams and canned fruits without added lemon juice. Fruits are acidic, and in my mind, they didn’t need any added acid to reach a safe pH for canning. It wasn’t until I was canning peaches, and I read that some varieties of peaches, namely white peaches, aren’t acidic enough to can. Fruits need to have a pH below 4.6 to be canned without additional acid, and commercial plums generally have a pH between 2.8 and 4.6. Some plums are dangerously close to the safe line, and when you’re using wild plums there’s no way to know if they’re acidic enough. They tend to taste more acidic than store bought, but a tiny bit of lemon juice is a good thing to add to be sure. Most of my homemade jams are low sugar recipes, regardless of whether or not they used wild or conventional ingredients. There’s just no need to add an absurd amount of sugar to a wild strawberry jam when they’re already so sweet, and less sugar generally means you can taste the fruit better. That doesn’t quite hold true with wild plums. Don’t skimp on the sugar when making wild plum jam, trust me on this one. Weight the plums, and add granulated sugar at a 1 to 1 ratio by weight. If you like sweet jam, you might want to add even a bit more than that. Plums, lemon juice and sugar is all you need to make a wild plum jam that’s safe for canning. The fruit already contains plenty of pectin, and don’t require any store bought pectin. Wild plums can be found in just about any climate or region where wild apples grow. They ripen from August through October, though it’ll be later in more northern climates. If you cant find wild plums, store bought plums can be substituted. To get the pucker of a wild plum jam, add in one part cranberries for every 3 parts plum. Since commercial plums tend to be much sweeter, make sure you reduce the sugar by 1/3 to 1/2. This simple wild plum jam recipe is written to be scaled. For every pound of plums, add in 1 pound of sugar and 1 tablespoon of lemon juice. Pit the plums and place them into a thick bottomed pot. Add in the lemon juice and cook for a few minutes, until the plums begin to release their juices. Add in sugar and stir. Simmer, stirring often for about 10 minutes. When the jam thickens, pour it into prepared canning jars. At this point, the jam can either be stored in the refrigerator or processed for 10 minutes in a water bath canner. After a 10 minute process, turn of the heat, wait 5 more minutes and then remove the jars from the canner. Allow the jars to cool, and after 24 hours place any unsealed jars in the refrigerator and use within a few weeks. A deliciously tart, wild plum jam perfect for using as a breakfast preserve or as a condiment on cheese platters. Includes directions for using both wild plums or commercially grown fruit. Add in sugar and stir. Simmer, stirring often for about 10 minutes. If using commercially grown plums make sure you reduce the sugar by 1/3 to 1/2 to compensate for the naturally sweeter fruit. When the jam thickens, pour it into prepared canning jars. At this point, the jam can either be stored in the refrigerator or processed for 10 minutes in a water bath canner. After a 10 minute process, turn of the heat, wait 5 more minutes and then remove the jars from the canner. If you cant find wild plums, store bought plums can be substituted. 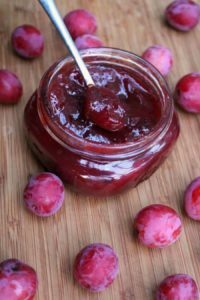 To get the pucker of a wild plum jam, add in one part cranberries for every 3 parts plum. Since commercial plums tend to be much sweeter, make sure you reduce the sugar by 1/3 to 1/2. Ashley lives in a solar and wind powered home in Vermont with her husband and two young children. She writes about gardening, foraging, DIY and all things off grid at Practical Self Reliance. You can find pictures of her adventures on Instagram(@practicalselfreliance), or follow along on Facebook or Twitter. Look at those cute little plums! Well, they definitely do not grow here in Alberta so I’ll have to live vicariously through you. I’m on a concorde grape kick right now! this looks so yummy! i love making my own homemade preserve but I’ve only ever done raspberries!!! will have to try this asap! It’s delicious! 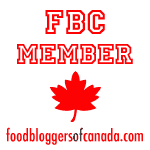 I usually use commercially grown fruit, but am trying to use more wild foraged foods! I had no idea that wild plums were even a thing!! I’d love to figure out how to find some of these up where I live. You can ask around at your local farmers market! Sometimes someone is willing to give up their secret locations!